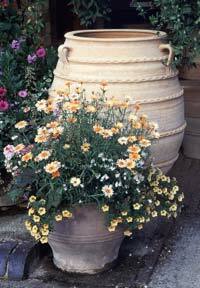 Pots and Pithoi introduced Cretan terracotta to the UK over 20 years ago. Ever since then they have searched every region of Crete for their traditional pots and gradually selected the best shapes and potters to create over 120 styles and 240 sizes. They continue to introduce new designs inspired by their visits and trips to museums, working closely with the new generation of potters. Pots and Pithoi's pots are frost resistant, made with top grade clay and fired traditionally using olive pips and grape seeds to over 1150°C to withstand the harshest of English winters. As an added bonus, they can convert any of their pots into water features or water butts for you, and either can make a unique addition to your garden. Pots and Pithoi have a collection of antique jars and vessels. 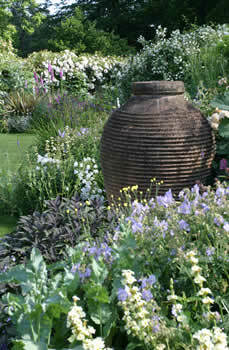 Relics of a bygone age, these pots add mystery and beauty to your home or garden. Inside their stone barn they sell many other beautiful things, including exquisite hand-blown glass, hand-painted ceramics, original Italian frescos, olive wood products, specialist foods and many of the smaller pots from their collection of antique pots from around the Mediterranean. Pots and Pithoi is about 10 minutes south of Gatwick Airport.